It’s hard to think that the holidays are right around the corner with the gorgeous weather we have been seeing lately in Chicago! With Thanksgiving and festive parties right around the corner, it is time to come into Sugar Fix and get a whitening before the holidays! 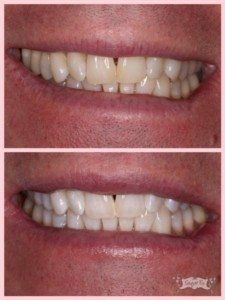 We have seen several patients this week for the Zoom whitening treatments and their results are awesome! It is a quick 1 hour 30 minute visit with us and you can catch up on your favorite Netflix show or watch a movie! The patient above completed 4- 15 minute treatments of Zoom and was very happy with his results. 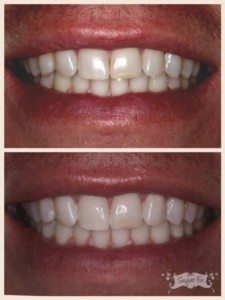 We gave him whitening trays afterward to do touch-ups after cleanings or for events! The patient above completed 4-15 minute round of Zoom whitening. He was pleased with his results, however, on his front left tooth there is a small bonding that is slightly discolored. The bonding was matched to the warmth of his teeth before Zoom. We recommended that he get it replaced with Dr. Emery soon to have the perfect smile! We always recommend the above for at least 24-48 hours after your Zoom whitening procedure. The more they are avoided, the longer the results will last. If you notice them fading, then it is time to pop in your bleaching trays for a fresh new look! To get a whitening before the holidays, call our office at any time and we will gladly brighten your smile! That is it for this week Sugar Fix followers, follow us on Snapchat and social media to see our Scottsdale C.E. courses next week!